Over the last four years, Mr and Mrs Dyke have refurbished their detached home just outside Chester, bringing a sleek and modern look to the entire house. The only thing left was the kitchen, so they decided to bring in the experts and get it right first time. Once the couple had decided that a major makeover was on the cards, it was a matter of finding the right company for the job. “We found Kitchen Design Centre quite quickly. What drew me in first was the company’s website – it’s very clear and we enjoyed seeing the case histories on there. The pictures of the completed kitchens really draw you in, so we decided it was worth coming over from Chester to have a closer look. We weren’t disappointed: the show-room was lovely and the staff were really friendly. 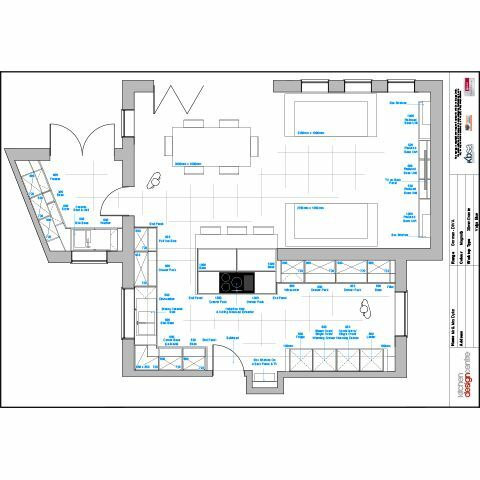 “We did go to another couple of companies but they didn’t come back as quickly or efficiently as Roger, our designer at Kitchen Design Centre. Once we’d spoken properly to him, we knew we didn’t want to go anywhere else. The couple’s taste runs to the minimalist, and they were keen for their modern kitchen to feature clean lines, reflective surfaces, and a stylish monochrome scheme. Roger’s design was realised using the Hacker Neo range in high-gloss magnolia and terra oak, with worktops in bold Star Galaxy – a polished black granite with rich bronze flecks. A large number of pull-out drawers and bi-fold wall units with chrome D-handles offer a wealth of storage without breaking up the smooth lines of the room. Easy-to-clean glass panels in pale aqua sit beneath the wall units, adding a subtle touch of colour and reflecting yet more light. An undermounted sink in bright white porcelain sits beneath the window, while a smaller ceramic sink has been installed in the utility area. Warm oak panelling runs through the kitchen and extension, which is home to a comfortable day room and diner, while the beautiful natural oak floor ties in neatly. 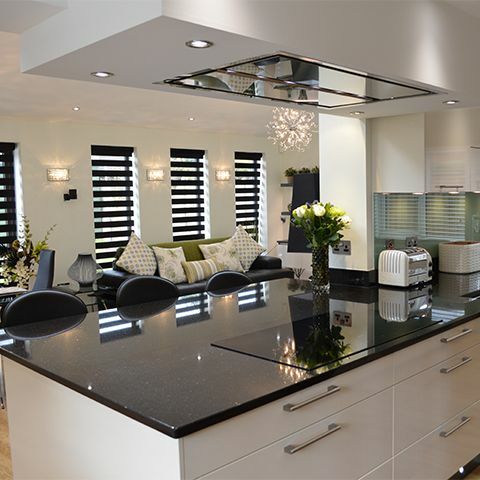 But while the kitchen itself is truly stunning, the appliances play a starring role. The Dykes have opted for a truly high-tech, high specification kitchen with a wide range of quality Neff kitchen appliances. The kitchen now has a combination microwave, two circo ovens – one of them with steam assist, two warming drawers, a top-of-the-range flex induction hob, a dual temperature wine cooler and a Cirrus extractor built into custom-made bulkheads. And in the utility area, there’s a tall, built-in fridge-freezer, a Neff washing machine and a Baumatic integrated tumble dryer. The lighting throughout the three rooms has been a major investment: plinth lighting, under-cupboard lighting, back-lighting, down-lighting and even bulkhead lighting – you name it, and this bright, airy kitchen has it. "We love the kitchen – there’s nothing about it that we’d change. The design is great, with so much extra space and storage – the only thing is: I can’t believe I’ve managed to fill the cupboards already!" 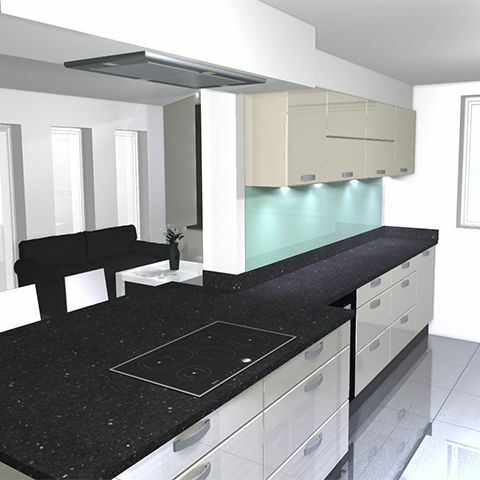 "This kitchen has made a remarkable difference to Mr and Mrs Dyke’s home. The large extension has opened up the space, and the integrated new design has transformed the back of the house. The new day room looks out over a freshly landscaped garden, and the whole area just works really well." "When it came to their kitchen, Mrs Dyke really wanted a room with the ‘wow factor’, and I think we’ve achieved that. That’s been the most rewarding part of the project: the couple’s genuine delight at what we’ve done for them."